Statistics is an essential tool when trying to evaluate both the usability and the user experience of a prototype. It allows you to interpret numbers in a systematic way and to communicate your results to the research community. This chapter will show you a number of statistical methods to analyze the data of your user studies and tell you how to report your results in a scientific publication. We will use a free software called R to do this. This chapter assumes that you know basic programming concepts like variables and arrays. The R software is a free statistics tool with enormous power. It is used around the world by researchers to compute statistics and to visualize their results. R is "command based" which makes it appealing to programmers since you can save snippets of "code" once you figured out a good way of analyzing your experiment so you can robustly repeat the analysis. To use R you first have to install it. Find your installation package on the R Homepage, download and install it. R Studio is still command based (lower left window) but has some more comfort functions. You type your commands in the window with the prompt (the > sign). Next, we will run you through some basic concepts. A vector can also contain other data like e.g. strings. 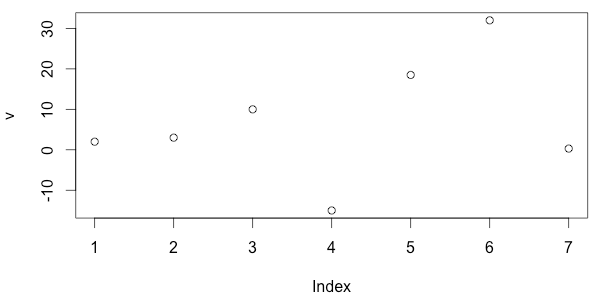 This shows you that the first index of the upper line is 1 and the first index of the lower line is 12. 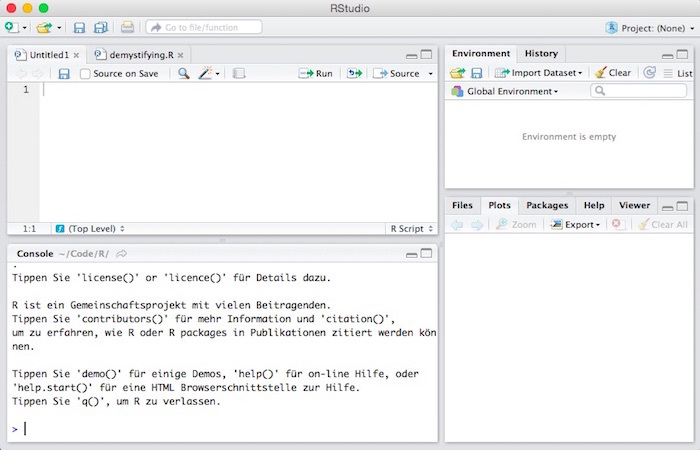 In R Studio, the help information will appear in the lower right window. Again, the output will appear in the lower right window. We know how to create a vector. You can also do vector arithmetic, i.e. compute with vectors. Usually, operations apply to all elements of a vector. "foo" "foo" "foo" "foo" "foo"
A data frame is a table with rows and columns, it can have column names and row names. You can create a data frame out of vectors. Let's say we have a vector r with ratings and a corresponding vector p with the respective prototype that was rated. We can put this into a table with three columns named "prototype", "rating" and "time". In both cases I assumed that the column names are listed on the first line (header). You can access a single cell like with a matrix. Always remember that in R indeces for data structures start with 1 and not with 0. The purpose of descriptive statistics is to summarize a (possibly large) set of numbers by a single number because - obviously - it is hard to look at a huge set of numbers (e.g. 100 user ratings for a product on a scale of 1 to 5) and figure out what it all means. Examples for descriptive statistics are: min, max, mean or variance. In the first case, you are pretty sure the product is average. In the second case, the users seem to be undecided. Note, though, that in both cases the mean is 3! Therefore, we need a characterization of data width, variability or spread. The higher the spread, the less dependable the data is for the understanding of the general population. "We asked 6 students to rate our prototype on a scale of 1..5 and the results were quite mixed (M = 3, SD = 2.19)"
Apart from simply summarizing your data, statistics can be used to interpret your data. For our purposes, this usually means comparing two average values, e.g. the average rating for prototype A versus the average rating of prototype B. Imagine we do a user study to compare two prototypes A and B. We simply ask users to tell us how they like a prototype on a scale of 1 (not at all) to 5 (very much). The difference is not big but I would trust that prototype B is more popular from the reply pattern. So, yes, it is different. What about b and d? We can see that our intuition is reflected in the standard deviation. Is there a way to find out whether the difference between a/b or c/d is significant? The answer is yes. We utilize the t-test. The t-test compares two mean values and tells us whether these values are different to a significant degree, considering the variance in the data. In other words: if we would acquire more and more data would the difference remain or maybe go away? R shows us more but the interesting bit is the p-value (or simply p). This is the probability that the null hypothesis (H0) is true. The null hypothesis is that the two distributions actually have an equal mean value (and we just don't have enough data to see it). 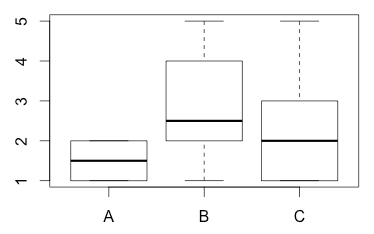 Since the p-value is low we can conclude that the the means of a and b are significantly different (i.e. if we had more data the values would likely still be different). Significance has been defined by the research community as p being smaller than 0.05. Let's remember again what we found out about the data in terms of descriptive statistics. The variation of the C/D data is much higher than the variation of A/B. 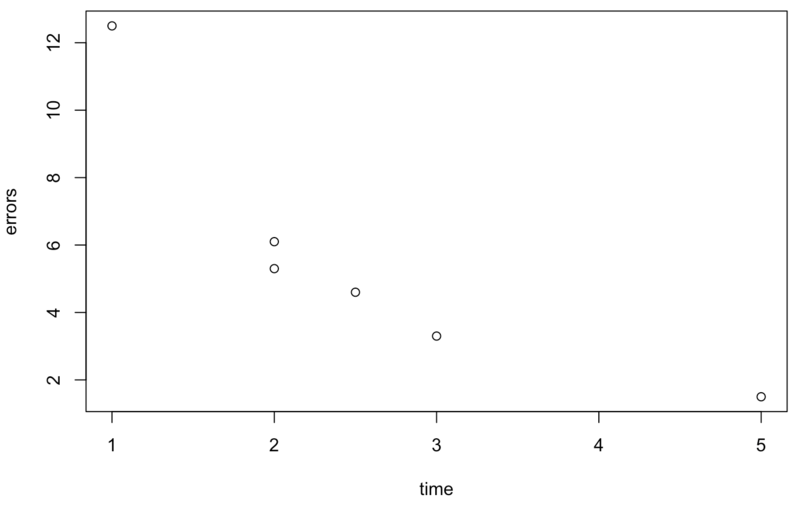 You can see that p is much higher for C/D (and clearly larger than 0.05) so there is a chance that the two means are actually equal (= null hypothesis) and simply because our data sets are so small they appear to be different. "Our subjects liked prototype B slightly better as revealed by a t-test, t(12) = -3.54, p < .05." As you can see, you only report p < .05 or p < .01. This is called the level of significance. It is important to note that the significance level of 0.05 has been arbitrarily set by humans. However, in research people stick very strictly to this number. If you have a very low p value (which is normally what you want) smaller than 0.01 you can speak of a highly significant result. These boundary values (0.05 and 0.01) are also called alpha level. So we can say that for a significant result we apply an alpha level of 0.05 and for a highly significant result we require an alpha level of 0.01. In the above example we had two prototypes A and B and each prototype was rated by a different group of people (between-subjects design). This experimental design actually requires that the two groups are comparable and to ensure this one needs a high number of subjects. We see that the p-value is higher than in our previous t-test (p = 0.004104). In fact, the difference in ratings is not even significant! This time, our result is significant (p < 0.05). So with paired data the order of the numbers obviously matters a lot. > "Our subjects liked prototype B slightly better as we could show with a _paired samples_ t-test, t(5) = -3.16, p < .05." A t-test only works if you have two prototypes. What if there are more? Let's say we now compare three prototypes instead of just two: A, B and C. We collect ratings for each prototype. We may think: well, just compute three t-tests for A-B, B-C and A-C! The problem with this is that we introduce the possibility that we get a significant result by chance, simply because to compute so many t-tests. So this approach is not allowed. Therefore, we use the so-called Analysis of Variance, short ANOVA, to find out whether the three means differ. This technique will tell us only if there is a difference somewhere between the three means. It does not tell us where this difference lies (between A and B, between B and C, between A and C). For the latter we have to run post hoc tests after the ANOVA analysis. Some terminology: for the fact that we look at different prototypes, we call "prototype" a factor with three levels (A, B and C). This is why here we are dealing with a One-way ANOVA. We are only looking at a single factor. We we wanted to examine gender effects and thus partition our subjects in male/female for analysis, we would then have two factors (prototype and gender). This calls for a different type of ANOVA called Factorial ANOVA. For easy use in R, store the rating in the following way as a file called e.g. "ratings.csv". Every rating appears on one line. We have two attributes: prototype (A, B, C) and rating (1..5). We can see under Pr that there is a significant interaction (p < 0.05) between A, B and C. However, we don't know whether it stems from A and B or from B and C or from A and C.
In the table we can see the p-values of the three possible pairwise combinations. We can see that only A and B differ significantly. Apart from Bonferroni adjument there are further adjustment methods that can be used in R (for p.adj): holm, bonferroni, hochberg, hommel, BH, BY. The latter two stand for "Benjamini-Hochberg" and "Benjamini-Yekutieli". An adjustment method is either more conservative (i.e. it is harder to get significant results) or more liberal (i.e. it is easier). So now we can say that in our data, prototype B is rated significantly higher (mean rating of 2.9) than prototype A (mean rating of 1.5). In contrast, the difference between prototype C (mean rating 2.2) and B could be a mere coincidence. In a scientific paper you an ANOVA you report the F-value with two degrees of freedom (Df) and the p-value. From the pairwise comparisons (post hoc tests) you report the adjustment method (e.g. Bonferroni or Holm) and the significant pairs. "An ANOVA showed that ratings differ significantly for the three prototypes, F(2, 27) = 3.78, p < .05. Post-hoc tests - corrected with the Holm method - revealed that prototype A was clearly preferred over B (p < 0.05)." To make it even more complicated, what if you have two prototypes and want to find out if there is a gender effect, i.e. if women prefer prototype A whereas men prefer prototype B. In this case, we have two factors: gender and prototype. When we have more than one factor we say that the experiment has a factorial design and the analysis method is a two-way ANOVA. We start with the case that there are four groups: female/A, female/B, male/A, male/B. This is called an independent factorial design. We can first think about what we could possibly find out. Our only dependent variable is rating. This is the measurement that we take in our experiments. Our two factors are gender and prototype. First, we could find out that gender has an impact on ratings, e.g. "women always rate higher than men". This would be called a main effect. It has nothing to do with prototypes. Second, we could find out that prototype has an impact on ratings. This is the same as the example for the one-way ANOVA. E.g., "prototype A is always better rated than prototype B". This would also be called a main effect. So in general, a main effect is an effect that is restricted to one factor. Third, we could find out that gender and prototype interact, e.g. "women rate prototype A higher, whereas men rate prototype B higher". This is called an interaction. What we want here is a non-significant result. Since the p-value is clearly above 0.05 the test shows that we can apply an ANOVA here. prototype           3.6  1   4.1143 0.0595074 . There is a highly significant main effect of gender (p < .01). There is no main effect on prototype. However, there is an interaction between gender and prototype (p < .05). Let's assume you have numerical data of two different types that you have measured in experiments, e.g. "The higher the amount of training, the lower the error rate"
Not only do you want to prove this hypothesis, you would also like to derive a model from your data which predicts - for future interactions - the error rate given a certain amount of training. If R is close to 1, the relationship is almost perfectly linear. If it is close to 0, there is practically no linear relationship. In our example we obain an R value of 0.85 which confirms our hypothesis that there is a linear relationship between training time and error rate. Since the p-value is smaller than 0.05 we can call this a significant result. T.C. Urdan (2010) Statistics in Plain English, 3rd edition, Taylor & Francis, 224 pages. A. Field, J. Miles (2012) Discovering Statistics Using R, Sage Publications, 992 pages.